"The decision to deny the possibility of accreditation to citizens of one participating State is without precedent and contravenes commitments made by all participating States to invite observers from any other OSCE participating States that may wish to observe election proceedings to the extent permitted by law," she wrote in a letter to Ukrainian Foreign Minister Pavlo Klimkin, some excerpts from which were quoted in the OSCE ODIHR statement. 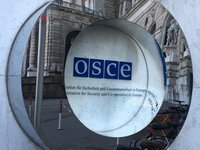 Gisladottir noted that observers sent to take part in ODIHR election observations missions do not represent their respective countries, but rather the entire OSCE and are bound by the ODIHR's strict code of conduct for election observers. On February 7, the Verkhovna Rada passed a bill, which will deny an accreditation to Russian representatives as observers of the OSCE Election Observation Mission in Ukraine.